What a classy cake! From the greenery to the ribbon to the bows to the cute animals...This is so well put together!! 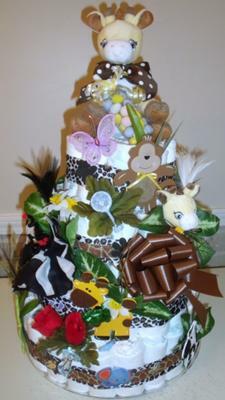 Our thanks goes out to Cindy from Boise, Idaho for this delightful Jungle Diaper Cake. Our readers have creative talent AND the desire to share it with others. Cindy, thanks so much for submitting your cake! If you have a diaper cake to share, send it on over!